FIREMAN SAM 2 FIGURE SET - DILYS AND NORMAN - AS IMAGE - NEW! 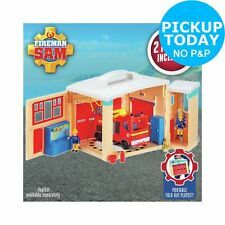 Fireman Sam Interactive Fire Station Rescue Set. Official Fireman Sam. Plush Soft Toy. All of our plush soft toys are suitable for all ages. BE SURE TO ADD US AS ONE OF YOUR. No accessories. Played condition few scuffs. In good played with condition, fire station is missing doors on one side. PUSH ALONG 4 X 4. MINOR PLAY MARKS. QUAD BIKE IS 4 1/4" (110mm) LONG. FIREMAN SAM. BOAT HOUSE. MAY CONTAIN A MINOR MARK. Hoopla Board (Can be Wall Mounted). Fireman Sam. 28cm x 36.5cm. In Good Condition - minor wear - small amount of staining to back of board - board is v. slightly bowed - No original box. HELICOPTER ROTORS CAN BE SPUN. LODGE HAS 2 OPENING DOORS AND VERANDA LIFT UP FIRE BOARD. MOUNTAIN LODGE IS:- 9" LONG. 4 X 4 RESCUE VEHICLE HAS 2 OPENING DOORS. Fireman Sam Toy Building. Supermarket / Dilys Shop. Complete with 2 moving shutters with flames on when pulled down (see photos). Very good used condition. Has the odd scratch / scuff from play. Any questions please just ask. I have other similar toys for sale and will happily combine postage if you contact me before paying. From a smoke and pet free home. Established and reliable seller with a 1000 100% feedback. Fireman Sam. : 3,5 x 7,0 x 2,0 cm Suitable for children from 3 years! : 3,5 x 7,0 x 2,0 cm. Bob the Builder. Feuerwehrmann Sam. Harry Potter. Information and manufacturer data. Die Peanuts. The rollable screen you can, like a smart phone with the thumb to move left and right, and so discover the different Fireman Sam designs. Fireman Sam. Sound Fire sounds and ringtones, no language. Light: small signal lamp. WILL ACCEPT VEHICLES WITH MAXIMUM OF 3 1/8" OUTSIDE WHEEL WIDTH. USED BUT IN GOOD CONDITION. 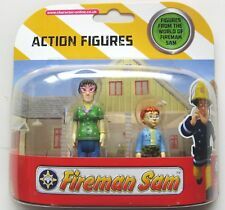 Fireman sam figure and accessory pack NEW - DAMAGED BOX. Condition is New. Dispatched with Royal Mail 2nd Class. Fireman Sam. 20x party napkins, paper napkins, 33x33 cm, 2-ply. Bob the Builder. for your Child. You want a party, and the dishes are out of work?. The successful party fun. Feuerwehrmann Sam. DC Super Hero Girls. Open the door and unwind the hose ready for action! Make up your own Fireman Sam Rescue Adventures! If there's a problem, just let us know and we will fix it. FIREMAN SAM PUSH ALONG VENUS RESCUE VEHICLE. 6" long with opening doors. Is in good used condition. Has wing mirrors and part of a sticker on one side missing (see photos) From a smoke and pet free home. Established seller with a 1000 100% feedback. Any questions please just ask. I will happily combined postage cost on multiple items if you contact me before paying before paying. By Fireman Sam Phoenix Firefighter Sam drives off with flashing lights to save a horse in distress. With the dishes and the crane, the horse is rescued quickly. Even in the dark has Fireman Sam with the headlights on his crane truck everything in sight. MINOR PLAY MARKS. THIS IS THE SMALLER NEWER VEHICLE. Styles may vary. One supplied. The Ambulance has opening doors to enhance the fun. Add To Favourites. This does not affect your statutory rights. In the unlikely event that you receive an item which proves to be faulty we are happy to help. The wind up function works fine, however we cannot get him to walk - assuming due to age. Fireman Sam is well-equipped for this job. Fireman Sam. Size Egg - Height: about 14 cm in Gift Box. Bob the Builder. This 19-piece Play Set is ideal as a Gift for Easter. Feuerwehrmann Sam. Notes and manufacturer data. ON / OFF SWITCH IS AT THE REAR OF THE DESK, PRESS THE BUTTON ON THE FRONT AND IT WILL MAKE RINGING SOUNDS, SAY PHRASES FROM DIFFERENT CHARACTERS AND THE BLUE LIGHT WILL FLASH, THERE IS ALSO A RED LIGHT THAT APPEARS ON THE MAP. HELICOPTER IS 6 3/4" LONG.